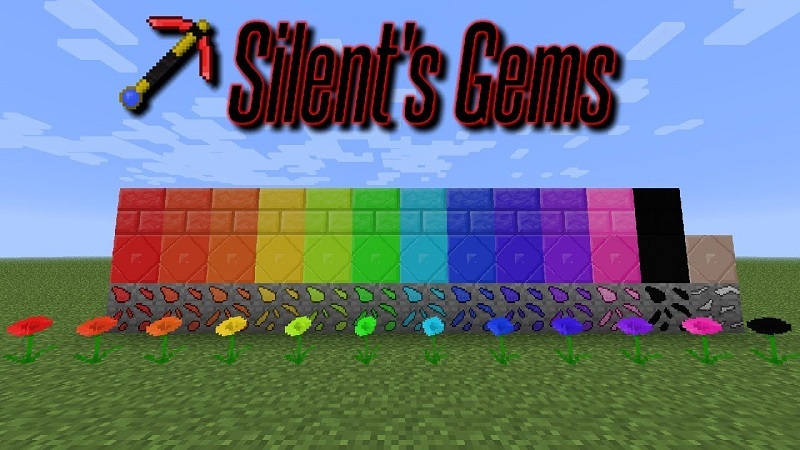 Silent’s Gems Mod 1.12.2/1.11.2 provides you with 48 new gemstones (12 in earlier versions) in the mod. 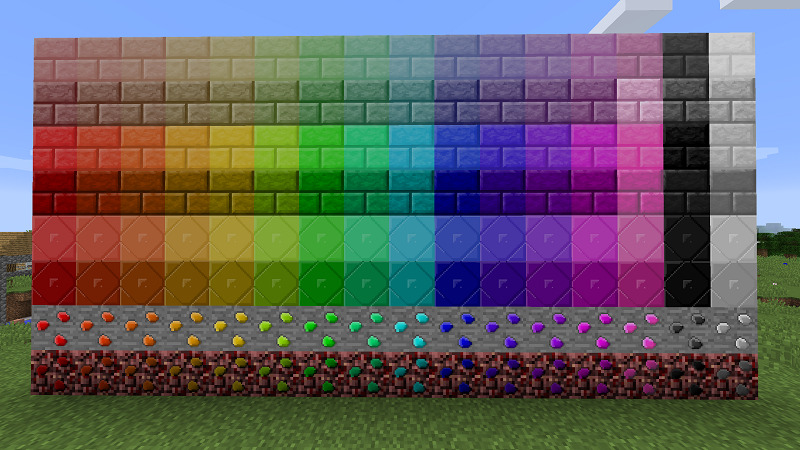 These can be used to craft a variety of building blocks and more tools. The tools are highly modular, and you can build a single tool out of multiple types of gems (and other things). Additionally, the stats of such a tool will depend on the parts used. After building a tool, it can be changed without changing the stats. Many higher tier tools also have special abilities that run on a type of energy called ‘Chaos’. Other blocks and items of note include modular armor, lamps, teleporters (powered by Chaos), enchantment tokens (which allow enchanting without randomness, but costing valuable materials andthe torch bandolier (stores 1024 torches in a single slot). Armor: Modular, like tools. Can be decorated (models WIP) and can provide more protection than diamond armor. Tools and armor can be made of the 32 gems you can find in the world, plus the “supercharged” gems that you can craft, flint, and even more materials if using add-ons. Each material creates items with different durability, mining speed, melee and magic damage, protection and toughness (armor), and enchantability. You can also craft tools and armor with more than one type of material — simply swap out parts in the recipe for different ones! After being crafted, tools and armor can be “decorated” by crafting them with additional materials. This changes their appearance only, not their stats. 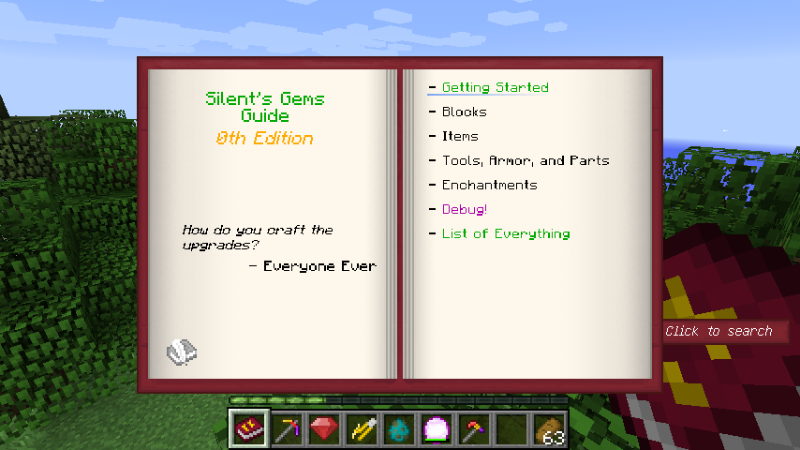 Silent’s Gems includes a variety of tools: everything from vanilla and more! Swords – Mostly like vanilla, but super-tier swords have a magic attack. Katanas – Faster than swords, but less melee damage and more magic damage. Super-tier only. Less durability than most tools. Scepters – Much slower than swords, low melee damage, but high magic damage. Super-tier only. Less durability than most tools. Tomahawks – Throwing axes. Low melee damage, but a thrown tomahawk can deal a devastating amount of damage, especially if it hits the target’s head. They are somewhat effective at chopping wood. Pickaxes – Similar to vanilla pickaxes, but they work on more materials like glass. They have the Area Miner super skill. Shovels – Mostly identical to vanilla shovels. They have the Area Miner super skill. Repairs are more effective. Axes – Similar to vanilla axes, but they can also break leaves quickly. They have the Lumberjack super skill. Hoes – Identical to vanilla hoes, but fancier looking. Sickles – Capable of clearing plants from a large area with a single swing! They can also harvest crops without breaking the plant. Paxels – A pickaxe, shovel, and axe all-in-one. It can mine basically anything, but is a bit slower than other tools due to its large size. It takes six materials to craft. Repairs are also less effective, but paxels get some extra durability as well. Super-tier only with Area Miner. 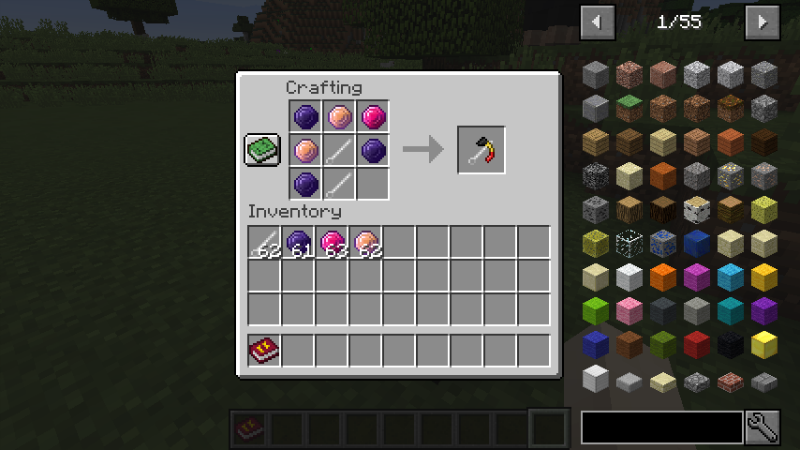 You should install a mod to view recipe in-game, such as JEI. I won’t give exact recipes here. Tools are made as you would expect, except that super-tier (supercharged) tools require higher tier rods instead of sticks/bones. In the base mod, you can use iron rods and ornate gold and silver rods. All rods must match when crafting a tool. Any item that can serve as a rod will have extra info added to its tooltip, including the compatible tool tiers. Magic Attacks – All super-tier “swords” (including katanas and scepters) have this ability. To fire, swing the weapon while sneaking. Currently, the system is far from complete. You will eventually be able to customize the attack, but for now it just depends on the sword type. Regular swords fire a gravity-affected projectile that bounces. Katanas fire three shots that trace the ground, damaging anything in there path. Scepters fire five homing shots that target a random nearby entity. Area Miner – Previously an enchantment. This allows super-tier pickaxes and shovels to mine a 3×3 area. Use the “Toggle Special” keybinding (default C) to toggle for each tool. Lumberjack – Previously an enchantment. Trees will fear you, as you can fell them by mining a single block! Use the “Toggle Special” keybinding (default C) to toggle for each tool. If you have a block in the slot after a pickaxe, shovel, or axe, you can right-click with your tool to place it. This also works with the Torch Bandolier. If that slot is not a placeable item, it will check the last slot of your hotbar instead. You can disable or tweak this feature in the config. Place a tool or piece of armor in a crafting grid. Then place materials in slots adjacent to it. This will exchange part of the tool/armor with that material, changing its appearance. You can also place a block of wool in any slot to add a cosmetic grip on the tool rod (does not work on armor). Decorating a tool or armor also repairs it, making it a good way to keep your best items alive! Flint can also be used for decorating, but will only repair flint tools/armor! Use glass to restore a part to its original state. Decorating can also repair a broken tool. All tools and armor will track various things as they are used, such as the number of blocks you’ve mined/placed with them, how many times you’ve struck monsters with them, etc. Hover over the item and hold Ctrl to view its statistics. All the parts of a tool or piece of armor need not be the exact same item. As long as they are the same tier, you can mix materials. This will average out the stats of the parts, but also gives a “variety bonus”. The variety bonus is small, so it may not always give better stats. Experiment to see what works! 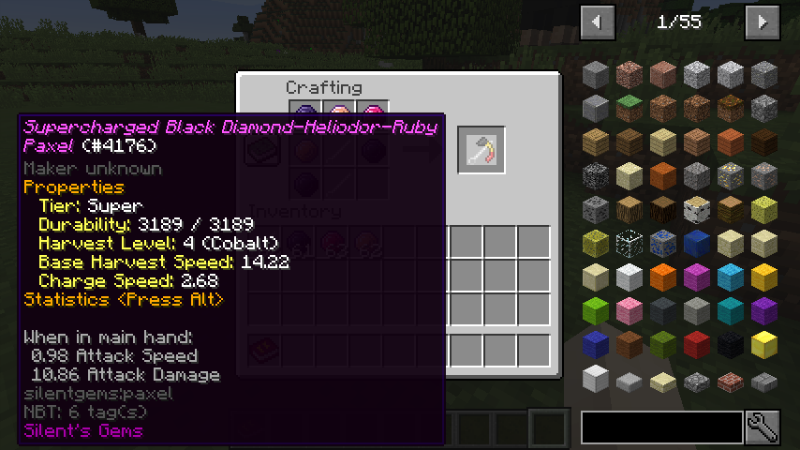 In this example, the Black Diamond makes up for Lepidolite’s low durability, at the cost of some magic damage. 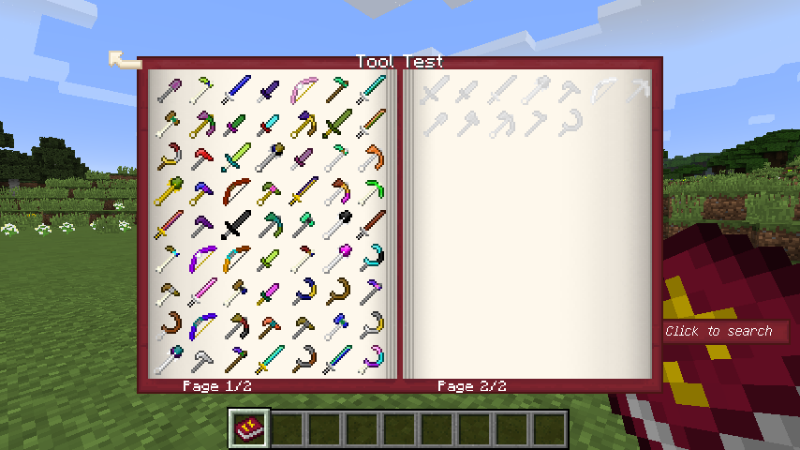 Tool parts refers to items that can be used to craft tools and armor. This includes gems, for example. If using Extra Parts, many common ingots are as well. Technically, tool rods are also parts, and each part has a ‘tier’ assigned to it. When crafting a tool or armor, the tier of each part must match. The tier of the tool is also determined by the parts it was crafted with. Decorating with parts of a different tier will work, but may not repair the tool. Tool parts will also have information added to their tooltips, such as their tier and stats. Many tool parts can also be graded in the Material Grader. This will assign a random grade (or ranking) to the part. Possible grades (lowest to highest) are: E, D, C, B, A, S, SS, SSS, with ‘B’ being the most common. Grades are normally distributed, meaning both high and low grades are less common. As stated above, the Material Graded grades tool parts. It requires Chaos to function (see the section on Chaos further down the page), meaning it should be placed near Nodes or Pylons. Items can be piped into the top or sides and out the bottom. Currently not in 1.9! I’m leaving this info here for players of earlier versions! How to use: Craft a Chaos Gem with Chaos Runes to give it effects, one rune per level. They can be activated by either right-clicking with them in your hand, or pressing a key (check your keybindings). Chaos Gems were overhauled in 1.3.00-beta03, see below for version specific info. For versions 1.3.00+: Chaos gems must be charged in a Chaos Altar. They will no longer regenerate charge on their own, unless crafted with Mini Pylons. Capacity and Booster runes no longer exist. Their max capacity is locked at one million units. Higher levels of effects will add to the charge drain, an extra 20% per level above 1. Flight is highly reliable and has no known bugs. For versions 1.2.07 and lower: Chaos gems will recharge by themselves. The recharge rate can be improved using Booster runes, and the total charge can be improved using Capacity runes. Higher levels of effects do not impact charge drain. Flight is usable, but has many bugs, making it very unreliable. Want to get around faster? Silent’s Gems has some modestly priced teleporters to use! As of version 1.3.00, there are three kinds: regular, redstone, and anchors. These teleporters are somewhat “dumb”. They don’t actually care if another teleporter exists at the destination, but you need two teleporters to set the destination. Recipes can be disabled in the config file. Place any combination of teleporters you wish (even anchors). Use a Teleporter Linker to connect pairs. You can link any of the three types together however you wish! Note that there are no actual “links” between the teleporters. The linker merely tells the teleporters where to send things. Try using anchors to establish one-way connections. In Silent’s Gems 2, teleporters require Chaos to run. They can draw it directly from the player, or can be powered by nodes or pylons. Earlier versions of the mod require XP. Short distances are free, longer distances require linearly increasing amounts of XP, and traveling between dimensions has a flat cost. Redstone – In addition to the functions of the regular teleporters, these can be triggered by a redstone pulse. They can also teleport non-player entities! Teleporting non-player entities across dimensions is currently a bit broken, I don’t recommend it. Chaos is a magic energy produced by Nodes and Pylons. The player has a small internal buffer of Chaos. To hold more, you’ll need a Chaos Orb. The Altar can store Chaos and charge items. An early way of gettings Chaos. These blocks spawn naturally in the world. They don’t produce much, and send it infrequently. Nodes do have an interesting property however: they send a variety of “packets”, not just Chaos packets. These packets do different things, including repairing damaged items and attacking hostile mobs. One disadvantage of Nodes is that they aren’t easy to move. They can’t be broken; you need an expensive Node Mover item instead. Still, building your starter house near a Node could be useful. A faster way to get Chaos than Nodes. They can be crafted and placed anywhere you need them. They send Chaos in “packets” just like Nodes. But they ONLY send Chaos packets, none of the special ones that Nodes do. The player’s internal Chaos storage is a bit limited. To do much with it, you will need to carry a Chaos Orb with you. Chaos Orbs will automatically accept Chaos from any source the player can, such as Nodes or Pylons. In other words, stand near a Node or Pylon. You can also charge Orbs in an Altar. Glow Roses are light-emitting flowers that spawn naturally throughout the world. Their light is enough to prevent mob spawns just two blocks away. Spawn rates are configurable. Glow Roses can’t be planted in normal flower pots, but the Chaos Flower Pot is designed to hold them. Not only that, it greatly amplifies the light of the Glow Rose! A potted Glow Rose will also place phantom light blocks a good distance away, lighting up a large area. Note that your game may slow down a bit after placing a Chaos Flower Pot, but should return to normal in less than a minute. 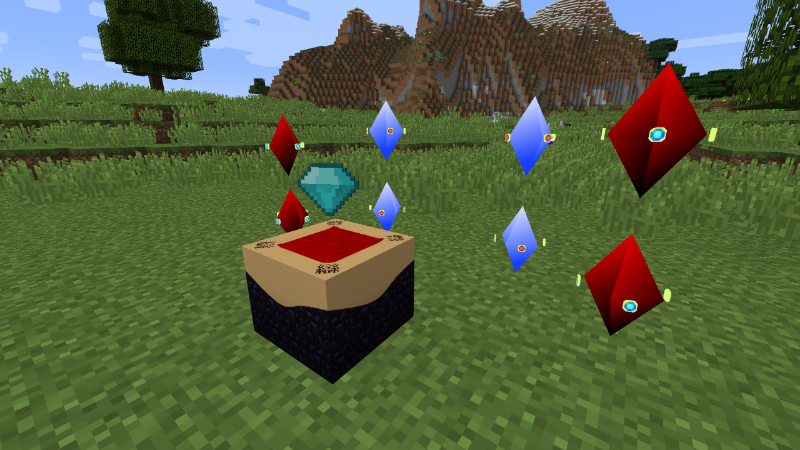 None of these enchantments exist in Silent’s Gems 2! They’ve either been made obsolete or were changed into something else. Return Home Charm – Right-click on a teleporter (anchors are fine) to bind it to that point. To teleport, hold right-click for a certain amount of time (24 ticks by default), then release! In Gems 2, it requires Chaos to function. Earlier versions use durability. Torch Bandolier – It stores 1024 torches. Because I like caving. Right-click to place torches. Place in a crafting grid to extract a stack of torches. It absorbs torches from your inventory on its own. Fluffy Puffs – A cotton-like plant used to craft soft things. Get the seeds by breaking tall grass, just like wheat seeds. Plant them to grow fluffy puffs, then use them to craft wool, string, feathers, fluffy fabric, or fluffy blocks. Make sure to download the latest version of Silent Lib as well! You will crash if using an older version.